What do you enjoy best in your job as VDC Manager? What inspires you? What I love about my job is using the latest virtual construction technologies to vet and resolve issues before they happen in the field. I can see a direct correlation with productivity and efficiency in the field because of the time I’ve spent coordinating a virtual mock-up. This really inspires me. Every effort that’s made to improve the coordination process eliminates waste and increases the overall success of a project. What mentors or mentoring opportunities have made the greatest impact on your career path? I graduated from Wentworth Institute of Technology with a Facilities Planning and Management degree. When I transitioned into construction, I had a lot of mentors within BOND that have had the greatest impact on my career. 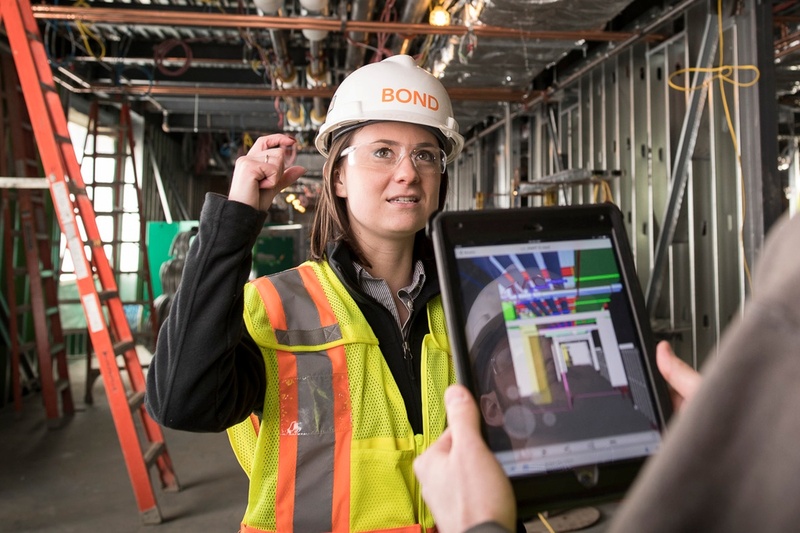 As soon as I was comfortable building relationships within the company, I reached out and joined several women in construction groups for networking and leadership skills. Having a mentor with an outside perspective is equally important for checks and balances as you grow in your career. What advice would you give other young women considering a career in construction? What things should they look for or ask? I would tell them to dive into the “nitty gritty” and learn everything you can to become an expert in something. It’s important to take that extra step and do your homework. Knowledge is confidence. If you can, find a female and male mentor and make sure you step out of your comfort zone as much as possible. I also highly recommend joining a networking group to meet new people and make new connections. It’s those unexpected relationships you build with people that will take you places.